Improper usage, mis-handling, excessive heat, heavy magnetic field and other similar reasons causes damage to the memory card resulting in the loss or inaccessibility of your precious photos. 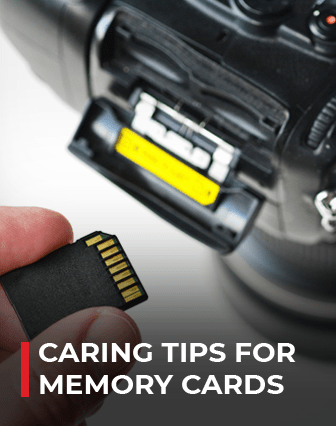 Obeying below memory card care tips, you can avoid losing your memorable photos, videos and other multimedia files to memory card corruption or damage. Reformat after copying files: Make a point to reformat the memory card each time after copying photos and other files to computer. Note: Do the formatting from the option available in the camera itself and not from computer. Keep memory card free: Try to avoid long term saving of much data on the memory card, even if it has a huge capacity. Backup is always a better option in the point of data safety and thus the memory card remains free. Don't make the card too full: Avoid the memory card becoming too full before transferring files to camera memory or computer. Note that sometimes if the memory card gets too full, it overwrites the card headers. Charge batteries sufficiently: Always keep the camera battery sufficiently charged before taking snaps so that it will not shut down in the middle. Shutting down of camera while taking snaps may corrupt the card. If required, keep another fully charged battery handy. Remove card after shutting down camera: Never remove the memory card, while the camera is still saving photo or video to it. Usually, videos take a while before completely being saved to the card; removing the card in the mean time can corrupt it. Shut-down camera few seconds after taking snaps: Never shut-down your digital camera immediately after taking a snap. Always wait a while and shut-down to avoid corruption of the memory card. Never take snaps too quickly: Always adhere to the manufacturer's recommended time interval and do not attempt to take snaps too fast. Avoid exposure to static charges: Always avoid using the camera or handling of the memory card, when there is large static charge present. Apart from this strictly avoid exposing the memory card to dry and low humid places. Avoid exposure to magnetic sources: Avoid exposing the memory card to sources with heavy magnetic, extreme heat and cold sources. Never pluck out card from card reader in the middle: Don't pull out the memory card from the card reader, when the card reader is still reading files from the card. Don't edit/delete with camera: Always perform the editing and deleting operations on the memory card from computer and not from the camera. Note that too many file editing and deletion in quick succession cause card corruption. Stop using erroneous memory card: On encountering any trouble in the memory card, stop using it immediately. Never try deleting pictures or reformatting the troubled card. It is safe to opt the services of a photo recovery solution provider. Careful with the card format option: Carefully perform the 'Delete All' and 'Card Format' options. Close all other operations take back-up of your important files and then perform these operations. Keep card of different camera separately: Don't use the card of one camera in another. Before using the card of one camera in another, format it with the new camera format.